A current carrying conductor placed in a magnetic field experiences a force demonstrated by Lorentz Law. Direction of the force is given by Fleming’s LH rule. Torque is directly proportional to the square of the armature current resulting high starting torque and directly proportional when field is saturated. Starting Armature current is high, and field is thus saturated early. It provides higher torque within rated HP up to saturation. For deriving tractive effort and speed characteristics to match the load, variables are applied voltage and field flux. This achieved by varying the Single Phase 25kV AC Voltage through on load Tap changer, rectification, smoothing and applied to Traction Motor. Voltage can be varied in 32 steps. Field is varied by Resistance insertion in parallel to field though shunting contactor in 3 to 4 steps in WAG7 and WAP4 locos respectively. 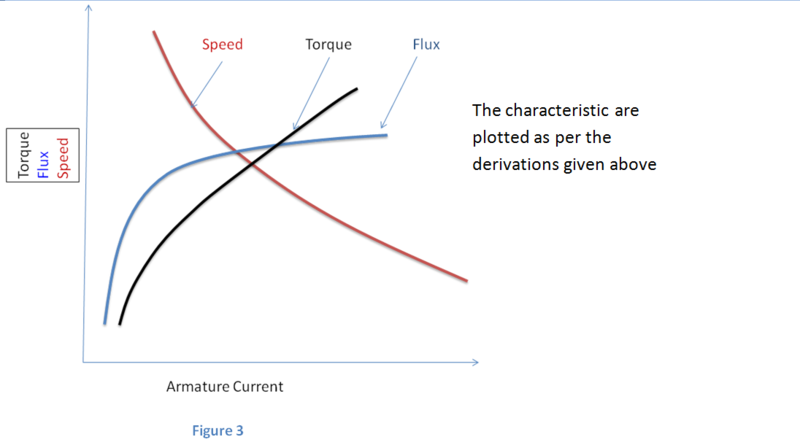 Limits are set on the torque speed characteristics of Series motor as Tmax and Smax as per the design parameter. Tmax is fixed on the basis of short term thermal rating of the motor and adhesion available where Smax depends on the mechanical design and the services the locomotive has to perform. Applied TE of tap changer locomotive is in steps due to tap changer control and peak has to be kept within adhesion limit therefore average TE applied is always less then adhesion limit. 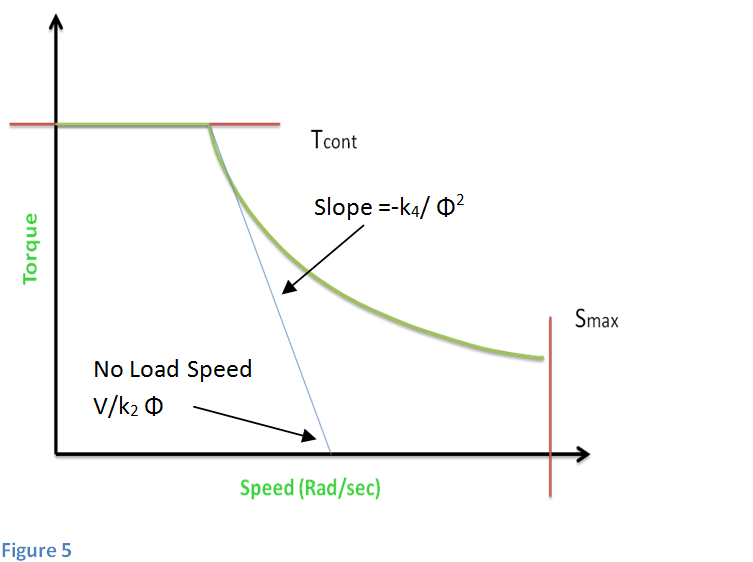 Speed Torque Equation of DC series motorLimits are set on the torque speed characteristics of Series motor as Tmax and Smax as per the design parameter. Tmax is fixed on the basis of short term thermal rating of the motor and adhesion available where Smax depends on the mechanical design and the services the locomotive has to perform. 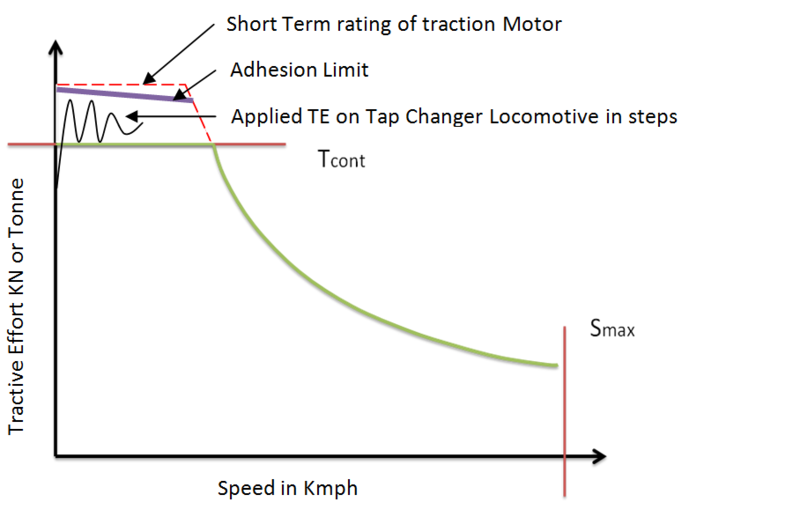 Applied TE of tap changer locomotive is in steps due to tap changer control and peak has to be kept within adhesion limit therefore average TE applied is always less then adhesion limit. The field is stationary and generated through main poles on stator frame. The armature winding is a closed winding through the Commutator and current is supplied through the brushes. Brushes are placed along the neutral axis of stator field. The mmf produced by the field (Ff) along the magnetic axis while the current flowing through the armature produces an mmf (Fa) directed along the brush axis. The two mmfs are in space quadrature and occur simultaneously in the motor. They react with each other and develop a torque under whose action the armature rotates. A voltage induced in armature can be determined by the Fleming’s left-hand rule. 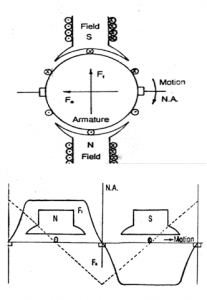 The picture below demonstrates field and its interaction to produce torque.